The Iowa Barnstormers have secured their place as #1 in the Indoor Football League and locked in home field advantage for the 2018 Playoffs after defeating the Cedar Rapids Titans 54-21 on Saturday, June 16 at Wells Fargo Arena. 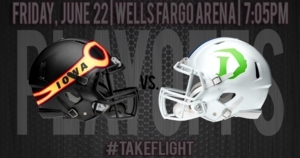 The Barnstormers will move on in the road to the United Bowl as they host the Nebraska Danger in the playoffs this Friday, June 22 at Wells Fargo Arena in Des Moines. Kickoff is at 7:05pm, doors open at 6:00pm. Tickets are available now for as low as $14 per seat. Contact the Iowa Barnstormers front office at 515-633-2255 or click here to purchase tickets. A victory will make the Iowa Barnstormers the host of the 2018 United Bowl Championship game on Saturday, July 7. Details for this event will be available following Playoffs.